Is laser hair removal permanent? Dr. Joel Schlessinger advises. Laser hair removal, a quick and safe procedure that removes unwanted body hair from your skin, is a common procedure performed every day in the United States. In just a few sessions of laser hair removal, your skin will feel smooth and soft, but many people want to know – is it permanent? Dr. Joel Schlessinger shares his findings on the topic. “While many clinics and physicians proclaim laser hair removal to be ‘permanent,’ the actual results are a little less than permanent as new hairs can grow to replace the old, lasered hairs,” Dr. Joel Schlessinger explains. Although there is a chance that hair can grow back, this procedure is the most effective at removing unwanted hair. “There isn’t a single medical or surgical treatment that has been as revolutionary in its benefits as laser hair removal and there are good reasons to consider it,” said Dr. Joel Schlessinger. Laser hair removal works by targeting the pigment in dark hair on light skin. It kills the follicle and prevents hair from growing. Dr. Joel Schlessinger notes that because of this, it is important to get it done earlier rather than later before hair begins to turn gray. Learn more about the best time to receive laser hair removal in this recent post from Dr. Joel Schlessinger. Interested in laser hair removal? Set up your consultation with Dr. Joel Schlessinger today. Joel Schlessinger MD has always been on the forefront of technological and research advancements in dermatology. Researchers and developers in this growing industry continue to push the limits by introducing better techniques and products that Dr. Joel Schlessinger incorporates into his business and practice. In this video, Joel Schlessinger MD makes predictions about what consumers can expect in 2013. He reveals that new procedures and techniques in CoolSculpting and Ultherapy are expected as well as changes in laser tattoo removal. Joel Schlessinger MD also explains that a new procedure designed to reduce the appearance of a double chin is expected. Finally, a new topical form of Botox may be available so patients can get great results without injections or needles. Watch the video now to learn more about these predictions. Leg veins can be unsightly and affect approximately 40% of women. This skin concern is most common for women who are constantly on their feet. Fortunately, there are several treatment options available to treat unwanted leg veins, as well as products to minimize the appearance of bruising. Joel Schlessinger MD’s recent presentation discusses several treatment options for spider veins and highlights products proven to diminish bruising. For specific treatment options, you should make an appointment to see your local dermatologist. Learn more about the various in-office procedures available to treat leg veins in this recent post from Joel Schlessinger MD. How do you treat leg veins? Share with us in the comments. When is the best time for laser hair removal? Joel Schlessinger MD shares. Laser hair removal is a safe and easy procedure that gets rid of unwanted body hair. This quick procedure can give lasting results for both men and women. But, when is the best time to receive a laser hair removal procedure? Joel Schlessinger MD shares his advice on this common question. “It is best to have laser hair removal performed in the late fall, winter and early spring rather than the summer,” said Joel Schlessinger MD. He explains that laser hair removal requires light skin and dark hair for the most effective results. The laser targets the pigment in the hair, killing the follicle and removing the hair. However, if the skin becomes darker, it can ruin the results of a laser hair treatment. “Sunlight causes a tan and any tan can shortstop the laser light, resulting in a burn,” Joel Schlessinger MD explains. For the best results, Joel Schlessinger MD says that laser hair removal should be performed in the cooler months when there is less of a chance that you will be exposed to prolonged direct sunlight. Have you considered laser hair removal? Find out if you’re a candidate for this innovative procedure here. A close shave can leave behind ingrown hairs that irritate the skin. These small bumps appear when the hair curls up inside the follicle as it re-grows, making it impossible for the hair to reach the surface. Luckily, there are several products available to help treat and prevent ingrown hairs. Joel Schlessinger MD’s recent presentation highlights several recommendations for gentle products proven to prevent ingrown hairs. For personalized treatment options, make an appointment to see your local dermatologist. How do you care for your skin to prevent ingrown hairs? Share with us in the comments. Earlier this year, Joel Schlessinger MD gave his expert commentary on the relationship between milk and acne. Recently, new revelations have been published that support his theory. “Family history, body mass index, selected dietary factors, menstrual history, and risk of moderate to severe acne in adolescents and young adults,” was recently published in the December 2012 issue of Journal of the American Academy of Dermatology. In this article, experts discuss the impact of different factors on moderate to severe acne. In the study, experts conducted a control-based study on the diagnosis of moderate to severe acne by assessing the impact of family history, dietary factors, personal habits and menstruation history. It was concluded that many of these factors led to a risk of moderate to severe acne, especially when the patient consumed large quantities of cow’s milk. “If you have a child with acne at an early age or acne that doesn’t respond to medications, please consider stopping milk entirely. This could make a huge difference in acne and other conditions,” said Joel Schlessinger MD. 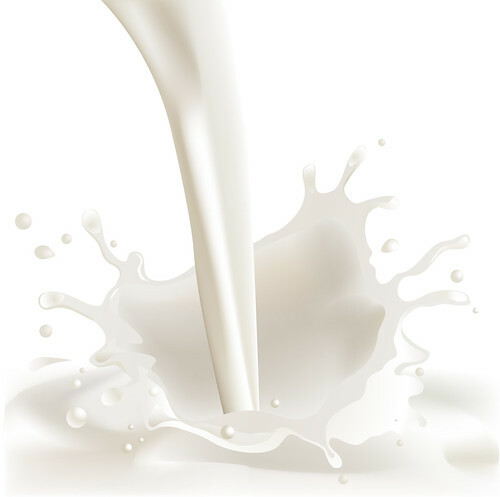 Besides causing acne, milk is also the culprit in many other health problems in adolescents and young adults. Laser treatments, chemicals peels and other in-office procedures can leave your skin feeling drier and more sensitive than usual. Sensitive skin needs more moisture in order to repair itself, but luckily, there are several products available to help hydrate and heal post-procedural skin. Joel Schlessinger MD’s recent presentation highlights several recommendations for gentle products proven to revitalize sensitive areas. For specific treatment options, make an appointment to see your local dermatologist. What products to you use to hydrate and soothe your post-procedural skin? Share with us in the comments. According to an article published in Modern Healthcare, nearly four in ten office-based physicians now use an electronic health record system. This is up from about one in three a year ago. Electronic health records are a digital format of health records that can be shared across different health care settings, helping to advance the accuracy of care. These records include statistics such as demographics, medical history, medications, allergies, immunizations, lab test results, vital signs, personal statistics and billing information. Dr. Joel Schlessinger and the staff at Skin Specialists PC recently implemented an electronic health records system. This new system has given the clinic great opportunities but it has also posed some challenges. 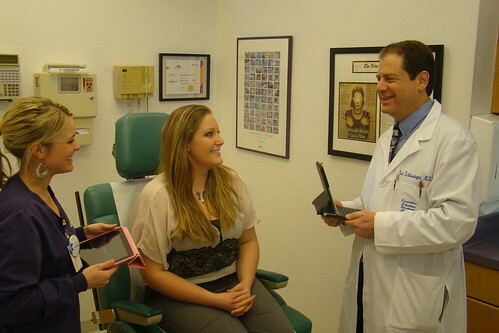 In the office, Dr. Joel Schlessinger and staff use iPads to take down information from patients. Although iPads aid in both speed and accuracy of clinic records, they do sometimes have issues such as disconnecting from the network. Although there have been some challenges, Dr. Joel Schlessinger says that the clinic has been doing much better with it. “It was brutal for the first two or three weeks, but it got much better. Now we are pretty much used to it and certainly liking most aspects of it,” he said. Dr. Joel Schlessinger says to keep on the lookout for this new system in offices around the United States. Do you use electronic health record systems in your practice or have you seen it in practice? Tell us your thoughts on this new system in the comments. Piercings are an extremely common accessory, but can often result in infections if they are not placed in an ideal location, done by a trained professional or not cared for properly. Joel Schlessinger MD created this video to offer his advice on where to get piercings, how to pick a proper establishment and how making the wrong choices can cause big problems. First and foremost, Joel Schlessinger MD advises that you do not get a piercing in an area that constantly comes in contact with bacteria. He also explains why it is important to make sure the establishment and individual offering the procedure are not only professional, but educated on the process. For more information on piercings, take a look at this video by Joel Schlessinger MD. Have you had a bad experience with a piercing? Share with us in the comments. Large pores can age your appearance. Without proper care, these small openings on the skin’s surface dull the complexion. Pore size can never be changed, but clogged pores can be exfoliated and cleansed, making them appear smaller. There are also several tools available to make the cleansing process more effective. Joel Schlessinger MD’s recent presentation on frequently asked questions about large pores highlights several recommendations for cleansing tools and products proven to unclog pores. For personal treatment options, make an appointment to see your local dermatologist. What products to you use to keep your pores clean and clear? Share with us in the comments.